For other people named John Bradley, see John Bradley (disambiguation). John Henry "Jack" "Doc" Bradley (July 10, 1923 – January 11, 1994) was a United States Navy Hospital corpsman who was awarded the Navy Cross for extraordinary heroism in combat on February 21, 1945, while assigned to a U.S. Marine Corps rifle company during the Battle of Iwo Jima in World War II. Bradley is best known for claiming to be one of the six men who raised the second of two U.S. flags atop Mount Suribachi, until it was revealed in 2016 that he did not. Bradley was one of the members of the 40-man combat patrol that climbed and captured Mount Suribachi on the morning of February 23, 1945. In June 2016, Bradley was identified as being at the first flag raising and helping to secure that flagstaff after the flag was raised. It also was determined that he was at the replacement flag raising about 90 minutes later, but did not actually raise that flag either. It was the second flag raising by six-men, that was captured in the world famous Pulitzer Prize-winning photo Raising the Flag on Iwo Jima taken by Associated Press photographer Joe Rosenthal. John Bradley was born in Antigo, Wisconsin, to James ("Cabbage") and Kathryn Bradley. He was the second eldest of five children. He grew up in Appleton, Wisconsin, graduating from Appleton Senior High School in 1941. His younger sister Mary Ellen died of pneumonia at a young age. He had an interest in entering the funeral business from an early age, because he felt those were the men everyone looked up to, and later got a job at his local funeral home. He then completed an 18-month apprenticeship course with a local funeral director before he entered the U.S Navy during World War II. Bradley enlisted the U.S. Navy on January 13, 1943 when his father suggested it as a way to avoid ground combat. Following his completion of Navy recruit training at the Farragut Naval Training Station at Bayview, Idaho, he was assigned to the Hospital Corps School at Farragut, Idaho in March 1943. After completing the Hospital corpsman course, he was assigned to Naval Hospital Oakland in Oakland, California. In January 1944, he was assigned to the Fleet Marine Force and sent to one of the "field medical service schools" at a Marine Corps base for training to serve with Marines. After completing the course, he was assigned to the 5th Marine Division on April 15, a newly activated infantry division which was then being formed at Camp Pendleton, California. He was reassigned there to Easy Company, 2nd Battalion, 28th Marine Regiment of the division. Staff Sgt. 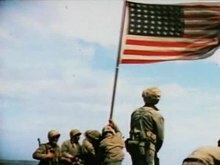 Lou Lowery's most widely circulated picture of the first American flag flown on Mount Suribachi (after the flag was raised). Left to right: 1st Lt. Harold G. Schrier (crouched behind radioman), Pfc. Raymond Jacobs (radioman), Sgt. Henry "Hank" Hansen (soft cap, holding flagstaff), Pvt. Phil Ward (helmeted, with two hands on flagstaff), Platoon Sgt. Ernest Thomas (seated), PhM2c. Bradley (helmeted, standing above Thomas with hand on flagstaff), Pfc. James Michels (holding M1 carbine), and Cpl. Charles W. Lindberg (standing above Michels). On February 19, 1945, the 5th Marine Division which included Bradley took part in the assault on Iwo Jima which was one of the most bitterly fought battles of the Pacific War's island-hopping campaign. Bradley was assigned to Third Platoon, E Company, 2nd Battalion, 28th Marines before and when they landed on the beach with the ninth wave of assault Marines at the south end of Iwo Jima near Mount Suribachi. After Bradley and PhM3c. Clifford Langley, the other E Company corpsman assigned to Third Platoon, aided American casualties on the beach, they continued on with E Company as the 2nd Battalion, 28th Marines advanced towards Mount Suribachi, which was their objective on the southwest end of the island. On February 21, Bradley risked his life under fire to save the life of a Marine at the base of the mountain who was caught in the open under heavy Japanese fire. While still under and exposed to enemy fire, and in order to save the lives of other Marines who were willing to expose themselves under fire to bring back the wounded Marine, Bradley brought the wounded Marine to safety himself. He was awarded the Navy Cross for his actions. At 8 AM on February 23, Bradley and Navy corpsman, PhM2c. Gerald Ziehme (replaced Langley who was wounded on February 21), were part of the 40-man combat patrol (mostly from Third Platoon, Easy Company) that was sent to climb up the east slope of Mount Suribachi to seize and occupy the crest. E Company's executive officer, First Lieutenant Harold Schrier who volunteered to lead the patrol, was to raise an American flag to signal that the mountaintop was captured. Lt. Schrier and his men reached the top after a small number of Japanese sniper shots, then there was brief skirmish at the rim of the crater. On top, the Marines found a steel pipe to attach the flag unto. The flagstaff was taken to the highest position on the crater. Schrier, Platoon Sgt. Ernest Thomas and Sgt. Henry Hansen, raised the flag, planting the steel pipe into the ground approximately 10:20 AM. Seeing the raising of the national colors immediately caused loud cheering from the Marines, sailors, and Coast Guardsmen on the beach below and from the men on the ships near the beach. After the flag was raised, Bradley, who was with the group of Marines near the flagstaff, pitched in to help the flagstaff stay vertical in the terrific winds on the volcano. 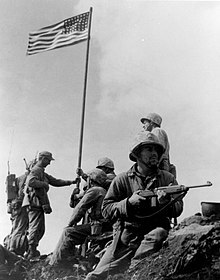 In order for the American flag to be seen more easily from the ships, beaches, and land off and around Mount Suribachi, it was decided that another larger flag should be flown on Mt. Suribachi. Marine Sgt. Michael Strank a squad leader from Second Platoon, E Company, was ordered to ascend Mount Suribachi with three Marines from his squad and raise the replacement flag. He then ordered Cpl. Harlon Block, Pfc. Ira Hayes, and Pfc. Franklin Sousley to go with him up Suribachi. Pfc. Rene Gagnon the company's runner (messenger), was ordered to take the replacement flag up the mountain and return with the first flag that was flying on top. Once all five Marines were on top, another pipe was found and the replacement flag was attached to it. At approximately 1 PM, Lt. Schrier ordered the raising of the replacement flag and the lowering of the original flag. The flag was raised by Block (misidentified as Sgt. Hansen until January 1947), Gagnon, Hayes, Pfc. Harold Schultz (misidentified as Bradley until June 23, 2016), Sousley, and Strank; Schultz was a member of the 40-man patrol. Bradley witnessed – but was not part of – the specific moment of raising the larger flag that was captured in Joe Rosenthal's Pulitzer Prize-winning photo Raising the Flag on Iwo Jima. March 4, 1945, Bradley shot a Japanese soldier with his pistol who was charging him with a bayonet as he was attending to a wounded Marine in a shell hole. March 12, Bradley and three Marines received shrapnel wounds from an enemy mortar round explosion. All four were quickly attended to by other corpsmen. Bradley was wounded in the legs and feet and was evacuated from the combat zone to the battalion aid station, field hospital, and was flown to Guam, Hawaii, and Oakland Naval Hospital. March 14, General Holland Smith ordered an American flag raised at Kitano Point on the northern end of the island, and the flag flying on the summit of Mount Suribachi be taken down. March 26, the battle of Iwo Jima was officially over. On March 30, 1945, President Roosevelt ordered that the three flag-raisers in Joe Rosenthal's photograph be sent immediately to Washington, D.C. to appear as a public morale factor. On April 8, the Marine Corps announced that Gagnon, Hayes, and Bradley were the three surviving flag-raisers in the picture and that Sgt. Hansen, Sgt. Strank, and Pfc. Sousley were killed in action. On April 19, President Truman requested that Gagnon, Hayes, and Bradley participate in the Seventh War Loan drive. On May 9, a flag-raising by Hayes, Gagnon, and Bradley at the Nation's capital kicked off the bond-selling tour which began on May 11 in New York and ended on July 4 with Gagnon and Bradley's return to Washington, D.C. (Hayes left the bond tour on May 25 after he was ordered back to E Company in Hawaii). The bond tour was held in 33 American cities that raised over $26 billion to help pay for and win the war (the war was over in Europe on May 2). Bradley was medically discharged from the Navy in November 1945. Bradley married Betty Van Gorp (1924–2013), settled in Antigo, had eight children, and was active in numerous civic clubs, rarely taking part in ceremonies celebrating the flag-raising — and by the 1960s avoiding them altogether. He subsequently purchased and managed a funeral parlor. Bradley's wife later said he was tormented by memories of the war, wept in his sleep for the first four years of their marriage and kept a large knife in a dresser drawer for "protection". He also had flashbacks of his best friend Iggy, Ralph Ignatowski, who was captured and tortured by Japanese soldiers. Bradley could not forgive himself for not being there to try and save his friend's life. 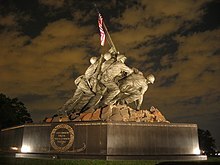 The Marine Corps War Memorial (also known as the Iwo Jima Memorial) in Arlington, Virginia, which was inspired by Rosenthal's photograph of the second flag-raising on Mount Suribachi was dedicated on November 10, 1954. Until June 23, 2016, Bradley was incorrectly depicted on the memorial as the third bronze statue from the base of the flagstaff with the 32-foot (9.8 M) bronze statues of the other five flag-raisers on the monument. Franklin Sousley is now depicted as the third bronze statue from the base of the flagstaff (Harold Schultz in place of Sousley is now depicted as the fifth statue). Bradley had a heart attack, but died of a stroke at 2:12 am in an Antigo hospital on January 11, 1994, at the age of 70. He is buried in Queen of Peace Cemetery, Antigo, Wisconsin. On June 23, 2016, the Marine Corps announced after reviewing new information in regard to the identities of the six second flag-raisers atop Mount Suribachi on February 23, 1945, that Marine Harold Schultz not Bradley is in Joe Rosenthal's photograph of the second flag-raising (Franklin Sousley is now where Bradley was thought to be in the photo and Schultz is now where Sousley was originally identified as being in the picture). The Marine Corps stated Bradley was involved with the first flag-raising on Mount Suribachi the same day. A previous Marine Corps investigation into the identities of the six second flag-raisers was held in December 1946 and January 1947 that determined Marines Michael Strank, Ira Hayes, Franklin Sousley, Rene Gagnon, Harlon Block and Navy corpsman John Bradley were in the photograph, and Marine Henry Hansen was not. Bradley is no longer identified as one of the six flag-raisers on the Marine Corps War Memorial. On April 3, 1945, Gagnon was the first second flag-raiser ordered to report to Washington, D.C. which he did on April 7, 1945. On April 8, after Gagnon was interviewed by a lieutenant colonel about who the second flag-raisers were, the Marine Corps incorrectly named Bradley (and incorrectly named Hansen) publicly as one of the six flag-raisers. While Bradley was recovering from his wounds at the Naval Hospital Oakland after the battle, he was shown the famous flag-raising photograph which appeared in the newspapers and was told he was in it. Bradley was then ordered to Washington, D.C. He arrived in Washington on crutches on April 19 as did Ira Hayes. Both men were interviewed by the same lieutenant colonel about who the flag-raisers were in the photograph. Bradley agreed with Gagnon and his naming Hansen and himself as flag-raisers. Hayes also named Bradley, and claimed he told the interviewer in charge who was the same lieutenant colonel, that Harlon Block was in the picture and Hansen was not. The interviewer told Hayes a list of the names of the six flag-raisers were already released publicly and he should stick only with these six names since Block was killed in action (in 1946, the lieutenant colonel denied Hayes ever mentioned Block to him). Bradley rarely did an interview for the newspapers, he refused to talk to and avoided reporters as much as possible. Throughout his life, the press would contact his home to ask for interviews and he trained his wife and children to give excuses such as he "was on a fishing trip in Canada." Even during the filming of the movie the Sands of Iwo Jima in 1949, Bradley told his wife to tell the townspeople that he was "on a business trip" in order to avoid attention that would be drawn to him." Despite his reluctance to talk to the media, family, and friends about the incident, he told his parents in a letter a few days after the incident that raising the flag was the "happiest moment of my life", though he was most likely referring to the first flag raising where he helped secure the flagstaff into the ground after it was raised and planted. Bradley saw the flag raising(s) as an insignificant event in a devastating battle. He rarely talked to people about it and spent most of his life trying to escape the attention he drew from allegedly raising it. He stated once that he "just happened to be there". He spoke to his wife once about the flag raising during their 47-year marriage. That was on their first date, and he seemed very uninterested with it during the conversation. His daughter Barbara said that "Reading a book on Iwo Jima at home would have been like reading a playgirl magazine...it would have been something I had to hide." He told his children more than once that the only real heroes on Iwo Jima were those that did not survive. I have tried so hard to block this out. To forget it. We could choose a buddy to go in with. My buddy was a guy from Milwaukee. We were pinned down in one area. Someone elsewhere fell injured and I ran to help out, and when I came back my buddy was gone. I couldn't figure out where he was. I could see all around, but he wasn't there. And nobody knew where he was. A few days later someone yelled that they'd found his body. They called me over because I was a corpsman. The Japanese had pulled him underground and tortured him. His fingernails... his tongue... It was absolutely terrible. I've tried hard to forget all this. Official reports revealed Ignatowski was captured, dragged into a tunnel by Japanese soldiers during the battle, and was later found with his eyes, ears, fingernails, and tongue removed, his teeth smashed, the back of his head caved in, multiple bayonet wounds to the abdomen, and his arms broken. Bradley's recollections of discovering and taking care of Ignatowski's remains haunted him until his death, and he suffered for many years from post-traumatic stress disorder. For extraordinary heroism in action against the enemy at Iwo Jima on Feb. 21, 1945 as a hospital corpsman attached to a Marine Rifle platoon. During a furious assault by his company upon a strongly defended enemy zone at the base of Mt. Suribachi, Bradley observed a Marine infantryman fall wounded in an open area under a pounding barrage by mortars, interlaced with a merciless crossfire from Machine guns. With complete disregard for his own safety, he ran through the intense fire to the side of the fallen Marine, examined his wounds and ascertained that an immediate administration of plasma was necessary to save the man's life. Unwilling to subject any of his comrades to the danger to which he had so valiantly exposed himself, he signaled would-be assistants to remain where they were. Placing himself in a position to shield the wounded man, he tied a plasma unit to a rifle planted upright in the sand and continued his life saving mission. The Marine's wounds bandaged and the condition of shock relieved by plasma, Bradley pulled the man thirty yards through intense enemy fire to a position of safety. His indomitable spirit, dauntless initiative, and heroic devotion to duty were an inspiration to those with whom he served and were in keeping with the highest tradition of the United States Naval Service. 1949: Sands of Iwo Jima, starring John Wayne. Bradley, Ira Hayes, and Rene Gagnon participated once in the film by raising the America flag in the flag raising scene on Mount Suribachi. 1961: The Outsider, starring Tony Curtis as Ira Hayes. John Bradley was played by Forrest Compton. 2006: Flags of Our Fathers. John Bradley was portrayed as a young man by Ryan Phillippe and as an elder by George Grizzard. The John H. Bradley Branch Health Clinic (Marine Corps Officer Candidate School) at Marine Corps Base Quantico (1995) in Quantico, Virginia. The John Bradley Memorial (2000), Wisconsin State Historical Marker and Site at Appleton West High School, Appleton, Wisconsin. Doc Bradley Hall (2012) at Camp Johnson's Field Medical Training Battalion-East's school located four miles south of Marine Corps Base Camp Lejeune in Jacksonville, North Carolina. ^ "The Navy Hospital Corpsman". Retrieved June 21, 2016. ^ a b  Rural Florida Living. CBS Radio interview by Dan Pryor with flag raiser Ernest "Boots" Thomas on February 25, 1945 aboard the USS Eldorado (AGC-11): "Three of us actually raised the flag"
^ Gibbons-Neff, Thomas (May 2, 2016). "Marine Corps investigating photo of iconic flag-raising on Iwo Jima". washingtonpost.com. Retrieved June 21, 2016. ^ "Marines: Man in Iwo Jima flag raising photo misidentified". FoxNews.com. June 23, 2016. Retrieved June 23, 2016. ^ a b c d e f g h i j k Bradley, James; Powers, Ron (2000). Flags of Our Fathers. New York: Bantam. ^ "The Mighty Seventh War Loan". bucknell.edu. Archived from the original on April 6, 2013. Retrieved June 23, 2016. ^ video: Funeral Pyres of Nazidom, 1945/05/10 (1945). Universal Newsreels. May 10, 1945. Retrieved February 20, 2012. ^ "Elizabeth M. Bradley Online Obituary, January 23, 1924 - September 12, 2013". Retrieved June 21, 2016. ^ The Marine Corps War Memorial Marine Barracks Washington, D.C.
^ "Memorial honoring Marines dedicated". Reading Eagle. Pennsylvania. Associated Press. November 10, 1954. p. 1. ^ "Marine monument seen as symbol of hopes, dreams". Spokane Daily Chronicle. Washington. Associated Press. November 10, 1954. p. 2. ^ a b c Bradley, James. "Iwo Jima Flag Raising on Mount Suribachi". Naval History and Heritage Museum. Viewed March 31, 2012. ^ Bradley, James. "Americas Battle: A Speech Given by James Bradley". Wikimedia Commons has media related to John Bradley.